Where to find Syke hotels near an airport? Where can I find hotels in Syke that are near tourist attractions? Travelers will find there is only 1 hotel option that are less than 0.1 kilometres (0.06 miles) from central Syke, so it's wise booking a place to stay as soon as possible. There are not many accommodation options within easy walking distance from the center of Syke. The Beauty & Wohlfühl Hotel is a good choice as it is only 3 kilometres (2 miles) away. The Dorint Park Hotel Bremen is located 20 kilometres (12 miles) from the heart of Syke. Another alternative is the Radisson Blu Hotel, Bremen, which is positioned 19 kilometres (12 miles) away. The Appart Hotel Heldt and also the Best Western Hotel Zur Post are some alternative accommodation options worth looking into around Syke. If you have the time, why not spread your wings and explore the many delights to be found in Lower Saxony - Bremen while you are in the region? Spend time at Lower Saxony - Bremen's old towns, historic mansions and churches and photograph the area's beaches. Fun-loving visitors may also try snowboarding and skiing here. The closest accommodation options in Bremen include Schnoor Quarter and Brinkum. Schnoor Quarter is 18 kilometres (11 miles) to the north of Syke, while Brinkum is 12 kilometres (8 miles) to the north. 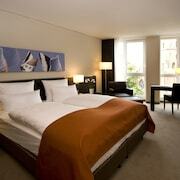 Schnoor Quarter hotels include the ATLANTIC Grand Hotel Bremen and Ringhotel Munte Am Stadtwald. 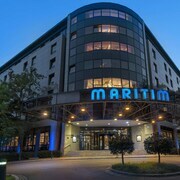 The ATLANTIC Hotel Airport and Holiday Inn Express Bremen Airport are amongst the hotels in Brinkum. Before you leave Bremen, why not make sure you experience some sport. Visit HDI Arena to the southeast of Syke. For travelers who are interested in sleeping nearby, make a reservation in the Cityhotel Königsstraße or Sheraton Hanover Pelikan Hotel. If you are traveling into or out of Neuenland Airport and plan to stay nearby try Designhotel ÜberFluss or Swissotel Bremen. What are the most popular Syke hotels? Are there hotels in other cities near Syke? What other types of accommodations are available in Syke? Explore Syke with Expedia.ca’s Travel Guides to find the best flights, cars, holiday packages and more!